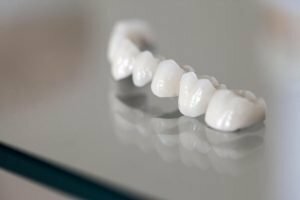 If you are someone who has discoloured teeth or implants, uncrowned root fillings, cracked, missing, damaged, or simply weak teeth, you might be a candidate for restorations like crowns and bridges. Crowns and bridges are prosthetic devices that are fixed on existing teeth or implants. This restorative procedure uses prosthetics to bring your smile back to its natural condition. Here at DonEast Supreme Dental, we want the best for you. With our state-of-the-art facilities and dedicated dentists, we provide quality crowns and bridges for patients of Doncaster East. A crown, usually made of porcelain or ceramic material, is used when the tooth structure is cracked or fractured. It protects the tooth or implant from further damage and infection. Crowns replace a large gap when there isn’t enough tooth remaining. They also protect weak teeth from fracturing, and restore fractured teeth. Crowns cover a dental implant, a discoloured or poorly shaped tooth, or a tooth that has had root canal treatment. Bridges are used to fill the gap between teeth. They are usually made of porcelain fused to metal to achieve maximum durability and natural look. Bridges are cemented between two crowns or implants, resulting in the look of natural teeth and helping maintain the shape of your face. Crowns and bridges play essential roles not just in bringing convenience and confidence, but also in bringing health to their wearer. They help prevent gaps that result in the remaining teeth shifting and forming a bad bite. Bad bites can lead to gum disease and TMJ, and we don’t want that to happen. The tooth must be reduced in size so that the crown or bridge will fit properly. Your dentist will take an impression to provide a mould for the crown or bridge. Your crown or bridge is manufactured according to the impression, in the material your dentist specifies. While the permanent crown or bridge is being formed, a temporary crown or bridge will be placed to cover the prepared tooth/teeth. When the permanent crown or bridge is ready for placement, the temporary fitting is removed, and the new crown or bridge is cemented over your prepared tooth or teeth. Crowns and bridges require the same thorough care as your natural teeth. It is important to brush and floss your teeth regularly to prevent dental plaque buildup. It is also recommended you maintain a regular cleaning schedule for your crowns. Avoid using your teeth to bite through hard objects. If you grind your teeth, wear a nightguard to protect them during your sleep. DonEast Supreme Dental is a team of skilled dentists who are one step ahead of other dental clinics in Doncaster East. We provide high-quality dental crowns and bridges to our patients. What makes us unique is that we have multilingual dentists who offer a complete range of preventative, restorative, and cosmetic dental services. We are easily accessible via public transportation. Call us at (03) 9842 1475 or visit us at 1062 Doncaster Road in Doncaster East. We are located near Tunstall Square Shopping Centre and offer on-site parking for our patients; easily accessible via public transportation.